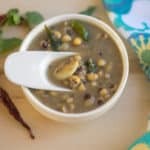 A simple Konkani style curry prepared with black-eyed peas and flavored with garlic tempering. Wash and soak the black beans for at-least 3 hours. Peel and roughly crush the garlic cloves. Cook the soaked black-eyed peas by adding turmeric powder, two drops of gingelly oil and 2 cups of water in your preferred way. I cooked on my instant pot for 8 minutes on high pressure, manual mode and let the pressure release naturally. In separate pan/kadai, heat the coconut oil. Then add the mustard seeds, hing, curry leaves, green chilies and the crushed garlic. Let the garlic brown and then add the cooked black eyed peas. Add the salt and mix. Bring it to a boil, and that’s it. Saaru upkari is ready. Serve hot with rice or roti. Adjust the green chilies, garlic, and salt as per your preference. Addition of gingelly oil is optional. I learned that it is always good to add few drops of gingelly while cooking the beans as it helps with digestion. You can replace black-eyed peas with other beans of your choice.